Our latest mission thread has us bringing an injured soldier home to be with his family. We only have to do it once, but American charity Fisher House did that over 17'000 times last year, bringing real life soldiers together with their family while hospitalised. 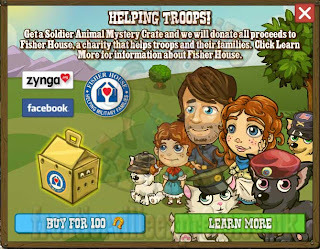 This, then, is the perfect time for Zynga to team up with Fisher House for a Charity initiative. To raise their profile we'll see a timed mission (details HERE) and on sale will be the new Soldier Animal Mystery box for 100HS. All proceeds from the crate's sales will be given to Fisher House. Inside is one of 6 Soldier animals, three puppies, three kittens.